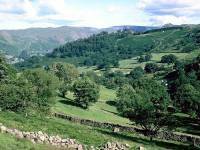 A beautiful days dawns in Glenridding - just right for climbing Helvellyn. I've chosen an unfamiliar route. 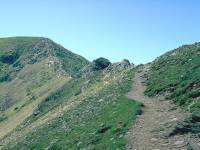 The upper reaches of the path lead onto the east ridge of Birkhouse Moor. Birkhouse Moor, 2318 ft, is recognised as a seperate summit though technically it is an eastern outlier of Helvellyn. 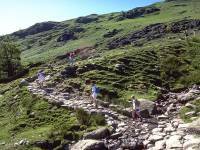 To the west, Birkhouse Moor narrows into the famous arete of Striding Edge. 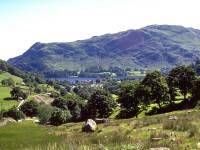 Also seen in this view are Glenridding Dodd (this side of the lake) and Place Fell (on the far side). The highest summits of the Pennines (Cross Fell, Little Dun Fell and Great Dun Fell) are well seen 40 miles away. Rather than tackle Striding Edge I've walked down to Red Tarn from the col and have stopped here for lunch. 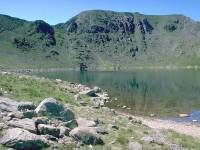 The tarn sits at 2300ft and the summit of Helvellyn is directly behind. From Red Tarn I've taken the short stroll northwest to the col between Helvellyn and Catstycam. The ridge between here and Helvellyn is Swirral Edge, a mild scramble. 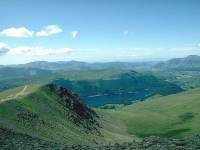 Of the four times I've climbed Helvellyn this is the only time I've had a decent view from the summit. 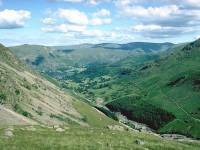 Helvellyn is England's third highest mountain, at 3118ft above sea level. 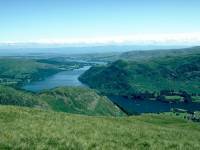 This is the view northwestwards, across Thirlmere towards Keswick. 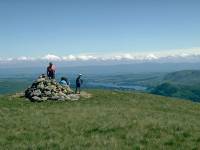 In the distance to the right is Skiddaw; the principal summits on the skyline to the left are Grasmoor, Eel Crag and Grizedale Pike. Scotland can be seen across the Solway Firth. 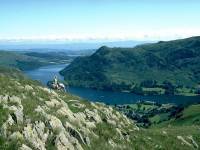 The descent on the north side of Catstycam comes down into the upper reaches of Glenridding. This is the view back towards the village, with the High Street group in the distance. 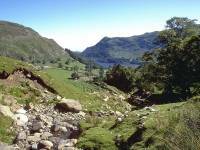 The old lead mine road in Glenridding is an excellent route to and from the fells. 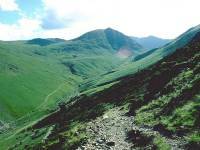 Catstycam appears directly ahead, with Helvellyn Low Man behind and to the right. A final look back as we reach the end of the walk in the late afternoon.